Cary sheet, Milan c. 1500. 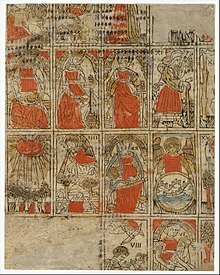 Trionfi (Italian: [triˈoɱfi], 'triumphs') are 15th-century Italian playing cards with allegorical content related to those used in tarocchi games. The general English expression "trump card" and the German "trumpfen" (in card games) have developed from the Italian "Trionfi". Many of the motifs found in trionfi are found in trionfo, theatrical processions that were popular in the Italian Renaissance. The Palazzo Schifanoia in Ferrara, once owned by the ducal House of Este, contains many murals depicting these floats. Petrarch wrote a poem called I Trionfi which may have served as inspiration. The earliest known use of the name "Trionfi" in relation to cards can be dated to 16 September 1440 in the records of a Florentine notary, Giusto Giusti. He recorded a transaction where he transferred two expensive personalized decks to Sigismondo Pandolfo Malatesta. Two decks from June 1457 seem to relate to a visit at Ferrara of the young Milanese heir of the dukedom Galeazzo Maria Sforza in July/August 1457. Each deck consisted of 70 cards — the modern Tarot deck typically has 78. Met sheet, Ferrara c. 1500. 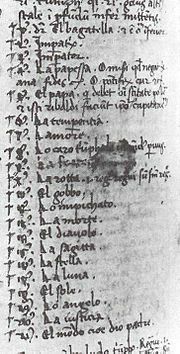 The first attestation of a deck with 78 cards was in a poem by Matteo Maria Boiardo of Ferrara written between 1461–1494. The deck was structured like modern tarots, but the motifs and suits signs of the Boiardo deck are totally different. He used classical figures for the face cards and trumps. Pier Antonio Viti of Urbino (c. 1470-1500), brother of Timoteo Viti, provided a commentary of Boiardo's poem as well as rules. He likely commissioned the production of these decks of which two incomplete packs have survived. Both the rules and the deck were likely conscious departures from common trionfi decks. The order of the trumps varied by region, perhaps as early as the 1440s. Michael Dummett placed them into three categories. In Bologna and Florence, the highest trump is the Angel, followed by the World. This group spread mainly southward through the Papal States, the Kingdom of Naples, and finally down to the Kingdom of Sicily but was also known in the Savoyard states. In Ferrara, the World was the highest, followed by Justice and the Angel. This group spread mainly to the northeast to Venice and Trento where it was only a passing fad. By the end of the 16th century, this order became extinct. In Milan, the World was the highest, followed by the Angel. This spread to Switzerland and France during the Italian Wars, becoming famous as the "Tarot of Marseilles". 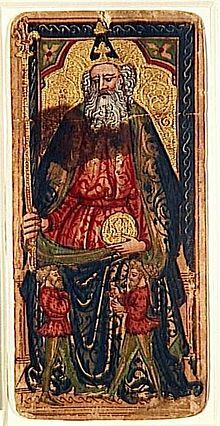 The earliest known appearance of the word "Tarocho" as the new name for the game is in Brescia around 1502. "Tarochi" was used in June 1505 in Ferrara. In December 1505, "Taraux" decks are mentioned as being produced in the papal enclave of Avignon in France. 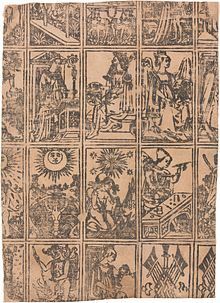 Around this time, the word Trionfi seems to modify its character in a playing card context; it appears as a game of its own (Rabelais knows a "Tarau" and a "Triumphe" game) and seems no longer connected to the specific allegorical cards. This is most likely due to the popularity of Trionfa which usurped the old name. The word taroch was used as a synonym for foolishness in the same period. As the Fool, which excuses the player from following suit, is the most unique feature separating the old game from Trionfa, it may be the reason for the adoption of "Tarocho". The Emperor, the only surviving trump from the Rothschild-Bassano deck. He carries a florin while holding a sceptre surmounted by the fleur-de-lis, both symbols of Florence. Expensive hand-painted, and usually gilded, decks custom-made for powerful clients have been preserved in greater numbers than mass-produced decks. More cards from the 15th and early 16th centuries have survived than those from the late 16th or 17th centuries. ^ Dummett, Michael (1980). The Game of Tarot. London: Duckworth. p. 87. ^ Pratesi, Franco (2012). "In Search of Tarot Sources". The Playing-Card. 41 (2): 100. ^ Pratesi, Franco (1989). "Italian Cards - New Discoveries". The Playing-Card. 18 (1, 2): 28–32, 33–38. ^ Caldwell, Ross G.R. (2004). "Marziano da Tortona's Tractatus de deificatione sexdecim heroum". The Playing-Card. 33 (1, 2): 50–55, 111–126. ^ Translation of da Tortona's treatise by Ross Caldwell", collected by Trionfi.com. ^ Galeazzo Maria Sforza original text, collected by Trionfi.com. ^ Dummett, Michael (1980). The Game of Tarot. London: Duckworth. pp. 76–77, 419–423. ^ Dummett, Michael (1980). The Game of Tarot. London: Duckworth. pp. 387–417. ^ Dummett, Michael; McLeod, John (2004). A History of Games Played with the Tarot Pack. Lewiston: The Edwin Mellen Press. pp. 13–16. ^ Depaulis, Thierry (2008). "Entre farsa et barzelletta: jeux de cartes italiens autours de 1500". The Playing-Card. 37 (2): 89–102. ^ Depaulis, Thierry (2004). "Des "cartes communément appelées taraux" 1ère Partie". The Playing-Card. 32 (5): 199–205. ^ Vitali, Andrea. Taroch - 1494 at Le Tarot Cultural Association. Retrieved 31 January 2018. ^ Fiorini, Cristina (2006). "I tarocchi della Collezione Rothschild al Louvre". The Playing-Card. 35 (1): 52–63. ^ Caldwell, Ross (2007). "Giovanni del Ponte and the dating of the Rothschild cards in the Louvre". The Playing-Card. 36 (1): 51–62. ^ French National Library. Retrieved 8 March 2017. ^ Este Tarot at the Beinecke Rare Book & Manuscript Library. Retrieved 10 March 2017. ^ ITA Sheet 3S at the Beinecke Rare Book & Manuscript Library. Retrieved 8 March 2017. ^ Gjerde, Tor. Italian renaissance woodcut playing cards at old.no. Retrieved 8 March 2017. ^ Rosenwald sheets at the National Gallery of Art. Retrieved 13 October 2017. ^ This ranking can also be found in Tarot, Triomphe, Ombre, Maw, Unsun Karuta, Madiao, Khanhoo, Tổ tôm, and Ganjifa. Look up trionfi in Wiktionary, the free dictionary. This page was last edited on 9 February 2019, at 11:37 (UTC).